I get a kick out of the image above. I'm being confronted by the club's big 2001 A-Side Forward of the Year, "English" Dan Buckley, and have a look on my face that suggests he's making a threat and I'm cowering! (The occasion was the 2/9/02 banquet.) Buzz gleefully looks on. Dan was probably just saying, "Well done." The slide show went well, despite a buzz in the audio line I couldn't get rid of. Here are my previous rugby journals: Rookie season, Second, Third, Fourth, Fifth, Sixth and Seventh. I did nothing. No running, and as little administrative work as I thought I could get by with. Burgers and Cokes at some Thursday night socials. I've been fighting some kind of upper respiratory thing for the past couple of weeks, so it was with some hesitation that I got out onto the pitch at 9 AM to run around in the cold. (It was 32 degrees when I woke up, but warmed to the 50's during practice.) Still, I found myself coughing whenever I took in a deep breath, and so knocked off after about an hour. The season was certainly started dramatically - we did a bleep test. (A bleep test is series of timed 20 meter dashes, with each series getting faster paced.) I made a raggedy level six before Dave Coddy motioned for me to fall out. I guess I must have looked pretty bad! P.J. 's afterwards - and the banquet that night. In the dustbin, where there is hard ground, one needs to game where to hit the tackling bags. Hitting them too high is bad form for actual match tackling, and, being more or less near the top of a lever, makes for a harder fall (often with a jaw on a bag). Hitting them too low causes ones' legs to get scraped on the dirt - which happened to me. As the practice wore on I started hitting them less quickly! We did a couple of odd variations tonight. We forwards did a scrum where we stepped not forward or backward, or pivoted around a point (wheeling), but moved sideways. It was very weird. Bindings became loosened and I felt a lot of odd pressures on my ribcage. Not fun. The other thing was a ball-handling drill wherein four forwards pass the ball over their shoulders, a la backs. It wasn't what one would call automatically successful. More variations, some of which caused us forwards to look glassy-eyed and slack-jawed at Coach Schnauzer, trying to figure out what it was he was trying to get us to do. ("Oh, look, they're trying to think!") We brought out the generators and lights for the first time in a couple of years - they are not missed. But in front of the dustbin, a few sets of lights and a generator are all that's needed. Not a whole lot of room on the grass, but we were able to do some drills that made the best of it and gave us all a good aerobic workout. One drill, a one-on-one tackling exercise, was a real wear and tear on us. There was one notable mismatch: me trying to catch Crazy Eddie, let alone tackle him. Yeah, right. About ten of us repaired to Glory Days afterwards, and discussed... cricket! Will there be a Western Suburbs Cricket Side? I shall begin a survey to find out if there's interest. We did one rucking-and-mauling-with-backs drill on this evening that I got sort of tired of after about 45 minutes or so, and stood out of. (Besides, my right shoulder was talking to me - somehow I hurt it on Thursday night, I think doing pushups...) The odd thing about this practice was the number of balls that were getting lodged up in beams and generally getting lost. More in one evening than the prior year and more that we've been using the dustbin. Lots of contact tonight in a number of drills; it was pretty wearing. At one point I got tackled hard onto the dirt ground, landing first on my knee, which got all scraped up and bruised. For some reason time seemed to stand still - this practice seemed endless! I won't be going to the Friday practice, however, and my first match of the season is Saturday. I suppose I'm as ready as I'll ever be, given all the requirements on my time these days. The first match of the season! After the Blacks (aka A-Side) played Winchester and beat them 35-10, the Suburbs Reds (B-Side) played the Blues (C-Side - although those designations weren't accurate as far as "B" and "C" sides were concerned - the coaches attempted to make an evenly-matched side). A game against Winchester and ourselves with three different sides (and only some Winchester personnel) was made possible by the fact that we had over 50 guys show up. Anyway, I played Blues and we won 37-7. We dominated in the scrum - despite the fact that there were a couple of painful scrum collapses. In light of the talent that was distributed among three sides; it appears we now have depth in bench, as it were. I only played a 30 minute half and was pulled out in order to let someone else play; too bad, I would have liked to play two halves. The weather was cool and I was fit enough to play. It certainly wasn't my best game ever, but it wasn't my worst, either. Anyway, a good start to the season. Afterwards we had our party at the most crowded establishment I had ever been in, in the historic district of Winchester. I was meaning to attend practice on Tuesday, but couldn't because of something that came up with Ethan at school. But... I put in an effort for Thursday despite repeated headaches all day. I did more scrummaging on this evening than I did in the entire previous season! The scrum sled tore up all sorts of turf on a grassy area next to the Dustbin - which I'm afraid might get us into trouble. Afterwards, Glory Days. 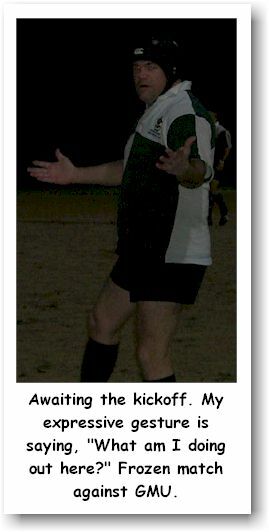 My sixty-first rugby match! A good one in that we won it 45-5 and I played both halves. (I've come to the conclusion that I like 30 minute periods; a good recreational length. 20 minutes is too short and 40 minutes is too long.) Anyway, I played in more or less my usual style, which could be characterized as teetering on competency. At one point I was trying to get involved in a rush at the try line, but was slowed down by an opposition player falling in front of me. So, no try. I haven't quite given up - but I'm not planning on it, either. The party was at a joint in Richmond called "Tiki Bob's"; interesting, but not enough so to keep me there for more than about an hour. Anyway, it was a fun day and I left feeling like I had accomplished something... which seems to mostly be why I play in the first place. A middle-of-the-week match against some local boys, just to tune up. Why not? Well, here's why not: It was COLD. How cold? In the high 30's/low 40's with gusts that blew through us like razors. It was very difficult to strip off the Boathouse jacket and sweatpants to get motivated for this one. But... the cold and an assistance from an energy drink had me darting from breakdown to breakdown pretty quickly. In fact, the coaches noted that we all seemed to be getting around the field somewhat faster than usual. No surprise there - we were trying to stay warm! The scrums were really fun in that it was us all the way; there's nothing like mature muscle and lbs. (Which is the usual Old Boys advantage...) At one point we could have easily had a 5 meter pushover try, but that didn't happen for some annoying reason. I played a better-than-average game for me, and came off the field feeling content with a 24-12 win. No, better than content - in a mood to celebrate, having overcome a middle age reluctance to do such a stupid thing, the oppostion players and the risk of injury. So, about 11 of us had some food and drinks at a place called "Fat Tuesday," which is a watering hole from Suburbs' past, when it was called Muggs. Got home at 10:40 PM. Cari and my girls (augmented by two more we have staying with us) were all laughing at a rented video, so I escaped censure. In this practice session we did a lot of sprints across the Dustbin floor, mostly drills designed to "create space" and "exploit gaps" - the kind of thing that is fundamental to modern rugby but, for me as a second row, in reality, almost never needed. Every now and then during a game I'll get the ball. When I do, there's almost always another big forward very close by and a tackle takes place. 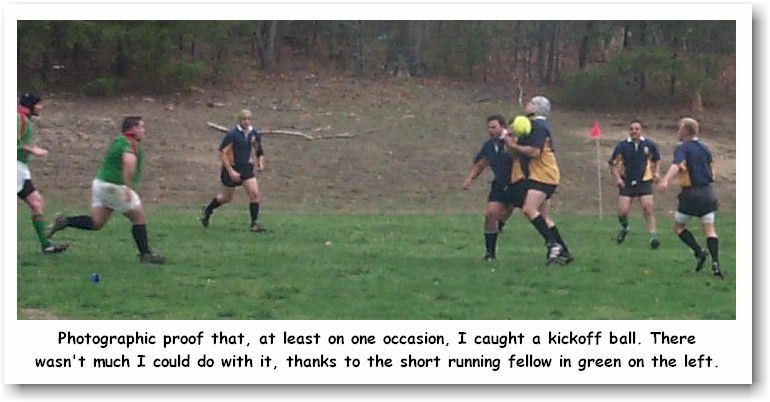 When I get tackled I go down with the ball to create a ruck - as I have been drilled to do many times for years. So, for me, the kind of thing we were doing during practice is like battalion level close order drill in Civil War reenacting: nice to work on but almost never needed. We broke off into forwards and backs. At one point, we were told to form groups of five of guys roughly the same size, so me, Matt Nassar, Jon Carter, Jay Anderson and Worf formed a unit - all 6' 2" or over, all over 250 pounds, the biggest guys in the club. We must have looked like a trail of boxcars moving from side-to-side along the width of the dustbin. Anyway, later we did some forwards drills attacking and defending, and I hurt my thumb and left elbow - t'was then I stepped out, with practice being nearly finished (or so I thought). We ended about 8:50 - an extended session. Glory Days for dinner, for the last time this season. Tuesday we move back to Dunn Loring with the coming of DST. It being a General Conference weekend, and my having no church, I played this on a Sunday. I woke up feeling pretty crappy - I'm catching a cold. But I played anyway, rugby having amazing restorative powers. (In the short term. As I'm writing this it's Monday morning, and I feel awful. I always get considerably more hammered in an Old Boys game than I do the B- and C-Side ones.) We won 19-5; a gratifying win. The weather was cool and brisk and I tried to bring my best game. It wasn't adequate for me to score my first try, however - this was the kind of game where only the backs scored and there didn't seem to be a lot of opportunity for the forwards. The scrums were fun: we drove them back just about whenever we wanted to, forcefully. I had a lot of fun with this match; it's good to play with my age-peers every now and then. We Reds and Blues got our butts royally kicked today, another one of those occasional rugby lessons in humility we get. If we occasionally give them, we must occasionally expect to receive. The Reds lost to Irish "A" by 7-66, and we Blues lost our match to Irish "B" by 0-41. The Blacks travelled down to play an understaffed Quantico, and beat them royally (no surprise there). Everyone is of the opinion that the match-ups were backwards - even the Washington Irish players were grumbling about it on the sidelines. Perhaps there's some logic behind this planning on the part of Rover, but I can't figure it out. It has always been my desire to beat the Quantico Marines fair and square in a b-match - but that's not going to happen this season. It was my worst match since my first match, and I am ashamed of it. (Come to think of it, my first match was better. We at least dominated the scrums, which wasn't the case here.) I was coming off a cold I've had all week - I didn't go to practice on Tuesday and Thursday because of it, and I almost entirely lost my voice on Friday - and the effects were felt of it during the match. I was pretty weak, and couldn't push well in the scrums, and had little energy to get around the field. I played a 35 minute half, and then about ten or fifteen minutes of the next half, when I was substituted (upon request). Oddly enough, after the match and after I had had some time to recover, I felt better than I had all week! But this is the last time I'll suppose my magnificent physical powers and youth will allow me to play rugby coming off of being sick. Also, it was a warm and rather humid day - far warmer than for other games during this unusually cold season. I recall always suffering during the first such day when I was a reenactor. Stands to reason the same thing applies to rugby, when though I'm wearing a light kit and not wool. There was only one bright spot: I caught a kickoff ball, which doesn't happen often. And since I handed the digital camera off to Jimmy "Big Gulp" Ibach for the match, there exists photographic proof. (See above.) Unfortunately, however, a short, heavy fellow came hauling down the field on the kickoff, and as soon as the ball was in my hands he was on me. The only thing I could do was more or less face my players and get the ball off to Worf (normally I'd try to make some headway up the field and set up a ruck). But we kept possession, which is the important thing. Afterwards, I spoke to the fellow briefly. He told me that in a few past games the opposition team had all scored trys off of kickoffs, so he took special pains to make sure that wouldn't happen with us! Afterwards we eschewed the party in the pub in D.C. put on by the Irish - too far to drive from Clinton, Maryland, where the match was held - and went instead to a place in Pentagon Row, and had a fun time. There was a lot of "us vs. them" sentiment expressed by the Reds about the Blacks; there were some (predictable) hard feelings about this weekend's match arrangements. In fact, in the Reds circle-up it was stated, "Okay, guys, today we're playing a real side, unlike the Division III sides the Blacks have been playing all season." On Sunday there is some Reds-only meeting going on in consideration of the playoffs on 27/28 April. I'm not going for two reasons: 1) I have church, 2) I'm not a Red. If the whole point of this weekend was to create a feeling of team spirit about the Reds, that has worked - but at he expense of club harmony. Personally speaking, I'm not sure if playing rugby this weekend was foolish or not... I do know that at this writing (Sunday morning), my ribs are sore from being compressed in a pileup (I was wondering when the impacts from the additional bodies would cease), my upper left arm is sore from some kind of a hit or another, and I am tenderly massaging a sore left ankle and a spot on my head where I think I took someone's elbow (I think too highly of the seat of my intellect to not wear a scrumcap). Also, my left thumb got a real bang at some point. But, hey, that's rugby. A very warm practice session - ninety degrees when I left the house. I'm always groggy and stupid on the first warm days of spring, and the pollen count doesn't help, either. Anyway, we split up into Blacks and Reds for practice; the Reds did some live tackling drills (which was anticipated, in light of the high tackling going on last Saturday). My sore upper left arm is difficult for me to lift, and I didn't improve things with the tackling drills. And at one point, holding a ruck pad, I got banged painfully on a sore right shoulder that had gotten injured in some past game earlier in the season. So... I ran three laps and called it quits. Since I don't really know if I'll be playing this Saturday, why not recover a little? We're also having practice on Wednesday, seeing as how the Blacks playoffs are coming up this weekend. For reasons stated above I won't be taking part! All of which begs the question: What does a 45 year old man (going on 46) need to do at rugby practice, anyway? This season I have attended practice less than any other - but I have also played less than any other. Maybe adjusting practice attendance with playing time makes sense. Or... maybe, finally, I'm getting bored and stale with rugby. Maybe I ought to take a season off. As regards the Reds playoffs weekend on 27/28 April: I was pretty sure I wasn't going to go because I was expecting not to be selected. Then I was. So I became 50/50 about it. Then I learned that my niece was coming in from Utah just before that weekend, with the usual D.C. sightseeing requirements - well, that shot the playoffs down. Or provided me with an excuse, I'm not sure which, really. Maybe I just ought to act my age and start playing Old Boys! All the neighbors were unaffected, and our next-door neighbors reported a very loud nearby crash during the storm. They also reported feeling a tingle in the air, as well as a smell of ozone. 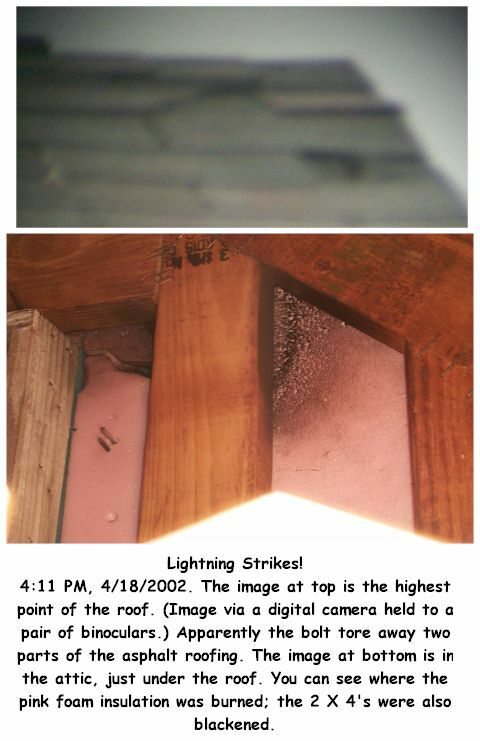 I can�t wait to see what the limits of our homeowner�s insurance are. The match for which the entire spring season was preparation. A 2 hour and 45 minute drive each way, spent in pleasant general conversation with Fred Bardot and Andrew Wang, whom I drove. (I now know the defining characteristics of a French redneck - Freddie explained it all.) The Blacks lost 12-26 on a hot and humid day. We took an early lead, but, in all, Norfolk simply played better than we did. Another problem was that we didn't get the ball out to the backline. We had an excellent backline for this match, but I don't recall the ball getting to them very often so they could attack. There was a lot of forward crashing. A second game was announced and agreed upon by both clubs prior to the match - but that decision was recinded by our coaches, desiring to preserve players for the Reds playoffs next weekend. Too bad; I wanted to play. Next week I won't attend practice at all as I'm not going to be at the Reds playoffs. (We'll be escorting a visiting niece around the D.C. sights.) I intend to practice for the alumni match, however. It's probably a good idea to lay off for a little bit... raising my right arm to comb my (admittedly scanty) hair is difficult because of a sore shoulder. Might as well let it heal some. This was a truly notable practice session in that Western Suburbs RFC set a new low for practice attendance: one (1). That one was me. All right, I'm being over-dramatic. Technically, there wasn't practice to be held at all. Coach Schnauzer told the Reds that they had Tuesday off, but were expected to come out for practice on Thursday to work out plays for the alumni match. So I wasn't expecting a lot of people, just die-hards and guys who wanted some exercise, and I figured I'd just run laps and do some ball-passing drills. But nobody was there at all save about ten soccer players, the scrum sled and yours truly. So I ran laps - then Cruz, Kevin Corry and Nate came by. We talked for about five minutes - then they left. I ran some more laps and went home. Click here to go to the Rugby Season Nine Journal.